Fourth of July is an opportunity to celebrate everything that makes our country great: our history, our diversity, and despite the width and breath of these great lands, those little peculiarities which will forever be just local. This Independence Day, we've chosen to celebrate by sharing some of the most bizarre traffic laws in different US states. Enjoy! ALABAMA: It is illegal to operate a motor vehicle while blindfolded. Did this have to be specified? CALIFORNIA: No unoccupied vehicle may exceed 60 miles per hour. Personally, I’d worry regardless of the speed. COLORADO: In Denver, it is illegal to drive a black car on Sundays. CONNECTICUT: Riding a bicycle in excess of 65 mph is a punishable offense. Although some might say you’d deserve a prize if you manage it. FLORIDA: Owners of elephants tied to parking meters must pay to park their animals there. Consider yourself warned, elephant owners. GEORGIA: It is illegal to drive through a playground. MICHIGAN: Sitting in the middle of the road to read a newspaper is illegal. And incredibly stupid. OHIO: Driving around the town square more than 100 consecutive times will result in a ticket. 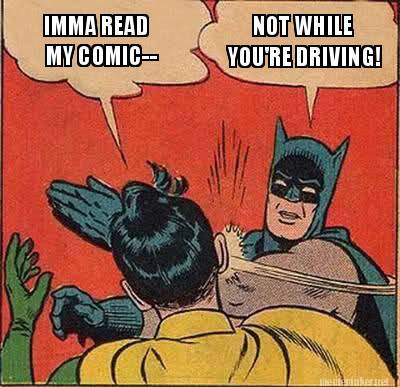 OKLAHOMA: It is against the law to read a comic book while driving. PENNSYLVANIA: While driving along country roads after dark, you are required to stop and detonate a rocket every mile so as to warn livestock of your location. TENNESSEE: It is illegal to shoot animals from your vehicle unless that animal is a whale, which - let’s face it - is unlikely in landlocked Tennessee.